Waka Flocka Responds To Mike Vick Telling Colin Kaepernick To "Look Presentable"
BHR Hollywood Reports..........Well, despite Vick backtracking his comments, the damage of his original remarks had been done and people are still irate about it. 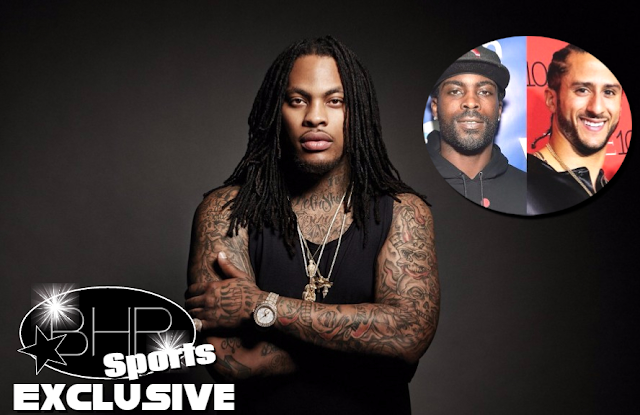 Yesterday, Waka Flocka took to his Instagram account and called Vick "real f**king lame for saying what you said about Colin Kaepernick." Waka was just getting warmed up. "They can accept your skills but not your image," Waka penned in his IG caption. "#AnotherCelebWhiteWashed. Power to number7. But the community stood up for you with that dog fighting sh*t."
We're here for Waka's comments, too. Of all people, we would have thought that Vick would understand Kaepernick's plight of NFL teams purposely staying away from him. After all, NFL teams hesitated to take a chance on Vick after he was released from prison in 2009 for his involvement in a dog-fighting ring. But his hair comments completely said otherwise and he brought this slander upon himself.